One of our little corgis is Gryffin, age six. He’s all boy, usually bossy, and noisy, and happy. He loves loves to go to work with Dad, run around in the grass, just generally loves to be outside (unless it’s raining, but that’s another subject for another time) in the sunshine, even just sitting on the porch. And when he’s inside, he’ll find a spot of sun on the floor and curl up there. 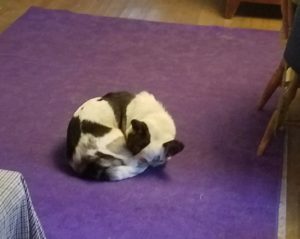 But the weather has turned a bit, since it’s now mid-September, and even though the afternoons are hot, there hasn’t been much sunshine on the floor in the mornings. Hubby found him like this today, early, wishing for the sun, and looking like he should be covered with snow. Poor baby! < Previous Plaid, Air Force, whatever.